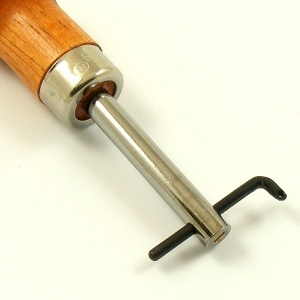 This adjustable leather groover is used to cut a shallow groove in the surface of your leather, ideal if you want to recess your stitching slightly into your leather, for either practical or decorative purposes. 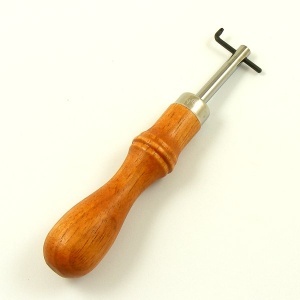 The black section of the tool does the cutting, and a screw in the end of the tool is loosened with a small flat-head screw driver (not included) to slide the cutting section back and forth, so you can choose how far in from the edge of your leather you want your groove to be. 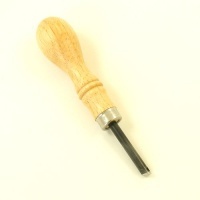 The maximum distance you can achieve between the groove and the leather edge is around 22mm. If you want something similar to this but heavier weight, we recommend you take a look at the Adjustable Screw Race shown below in related items.